One of Sarah Palin's top aides responded Sunday to mounting criticism that she had helped to incite the kind of violence that exploded in Arizona at a meet-and-greet by Ms. Giffords, wounding 20 and killing six. In the wake of the shooting, many people drew attention to a map of the United States that had been part of one of Ms. Palin's Web sites that showed targets on the districts of lawmakers who supported President Obama's health care legislation. 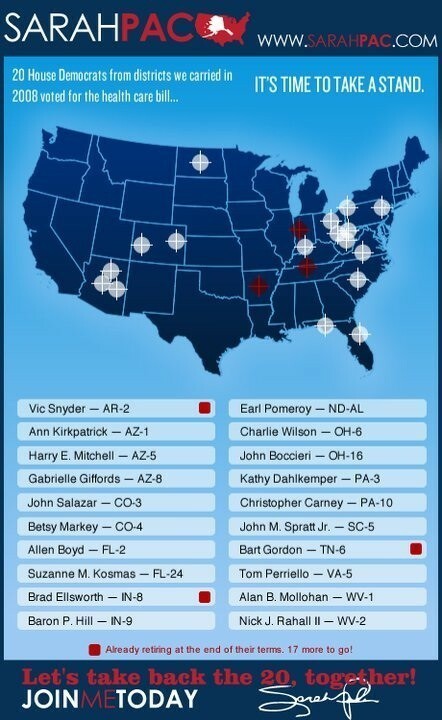 In a radio interview Saturday night, one of Ms. Palin's top aides, Rebecca Mansour, said of the map of lawmakers: "We never, ever, ever intended it to be gun sights." Ms Mansour said attemps to tie Ms. Palin to the violence were "obscene" and "appalling." "I don't understand how anyone can be held responsible for someone who is completely mentally unstable like this," Ms. Mansour said. "Where I come from the person who is actually shooting is culpable. We had nothing whatsoever to do with this." She added: "People who knew him said that he is left wing and very liberal. But that is not to say that I am blaming the left for him either." Ms. Mansour, who helps run SarahPAC, Ms. Palin's political action committee, made the remarks to Tammy Bruce, a radio talk show host, on a podcast made public on the internet. Ms. Bruce is introduced at the beginning of her show as "a chick with a gun and a microphone." "We all know that the liberals, there's something wrong with them," Ms. Bruce said. "The reaction on the left was to start blaming somebody." Ms. Bruce added that: "Saying that a mass murdering crazy guy is representative somehow of the political dialogue going on, especially with the non violent Tea Party movement....and yet there are attach this to the tea party and other politicians." I'd characterize this as the obtuse making excuses for the obtuse. The shooter in Tuscon clearly had a screw (or two) loose. But he didn't dream this scenario up on his own. And, the Palin crowd are hardly alone; think of all the nutters wearing their guns to political meetings last year. But here is the question to Palin and others: if there is no connection between the assassination of the federal judge and the attempted assassination of the Congresswoman and the murder of the nine year old girl, then why remove the graphic? If it was OK to run that graphic last fall, why not keep it available now? How come she's not Tweeting "Bullseye!" this time around? have had so much blood in her? The real irony is that Palin is targeting precisely those people who - by voting for Obama-care - are ostensibly working towards making it possible for individuals like Loughner to get the care and medical attention they need. Those most susceptible to act on Palin's appeals, in short, are those who remain in desperate need for more and better health care. As such, it is not only the language and imagery that is to blame but the very fact that Palin is defending a status-quo in which some of the most vulnerable members of society (the mentally ill) remain without proper care, and recruit-able as goons for a misguided cause.